Figure1. Preliminary cruise map showing planned operations for EX1-15-02 Leg 2. Figure created in ArcMap. Image courtesy of NOAA Office of Ocean Exploration and Research. Download larger version (jpg, 594 KB). 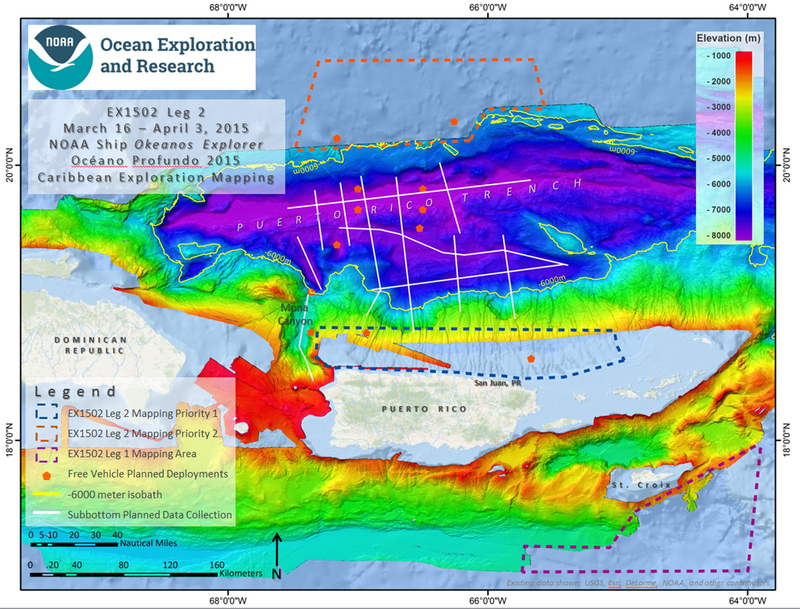 Océano Profundo 2015: Exploring Puerto Rico’s Seamounts, Trenches, and Troughs: Leg 2 is the second of three exploration cruises of NOAA Ship Okeanos Explorer in the Caribbean in the 2015 field season. 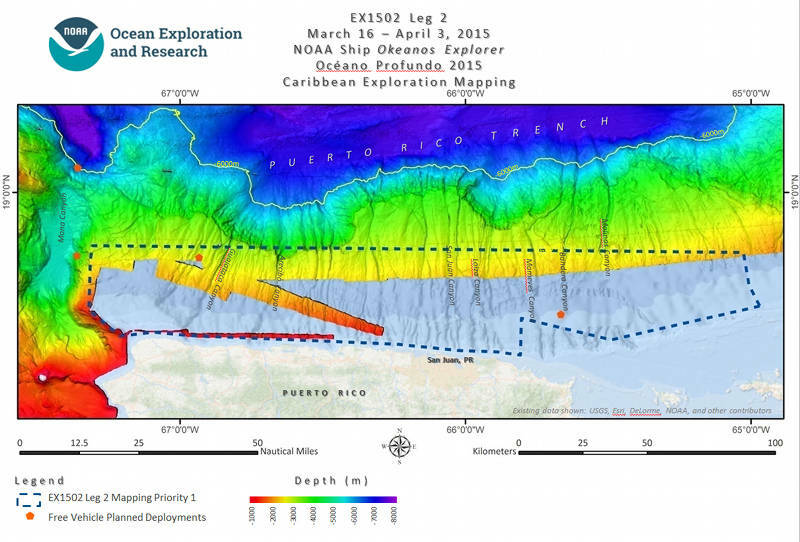 The primary focus of this cruise is high-resolution mapping of areas near Puerto Rico and the Puerto Rico Trench. This expedition will result in high-resolution maps of the bathymetry and acoustic backscatter data. Data collected and the products produced will (1) expand our limited knowledge of the Caribbean continental shelf, (2) help inform ocean managers tasked with protecting ocean resources, and (3) lay the foundation for future exploration and research. Figure 2. Preliminary cruise map showing Priority 1 survey area. Figure created in Arcmap. Image courtesy of NOAA Office of Ocean Exploration and Research. Download larger version (jpg, 631 KB). Mapping regions were chosen based on input from the ocean science, management, and exploration community received during a 2013 workshop hosted by NOAA and the Ocean Exploration Trust. Participants included members of the ocean management community and numerous federal and territorial partners, including the U.S. Geological Survey (USGS), NOAA’s National Centers for Coastal Ocean Science, NOAA’s Deep Sea Coral Research and Technology Program, the Caribbean Fisheries Management Council, Puerto Rico Sea Grant, Univeristy of Puerto Rico, and the Puerto Rico Departamento de Recursos Naturales y Ambientales. Mapping Priority 1 is a 120 nautical mile (nm) by 20 nm section of seafloor north of San Juan on the wide, gently sloping continental slope (Fig. 2, 3). This section of continental slope is a tilted carbonate platform sliced by a series of canyons, which act as transport conduits bringing sediment from the island of Puerto Rico down into the trencha. Based on low-resolution bathymetric data derived from satellite altimetry, we expect to find depths of 200 meters to 2,000 metersb, and have planned to complete our survey of the area in approximately six days. Figure 3. Oblique view showing Priority 1 survey area. Figure created in Fledermaus. Image courtesy of NOAA Office of Ocean Exploration and Research. Download larger version (jpg, 417 KB). Mapping Priority 2 is a 110 nm by 40 nm unmapped section of the interface between the North American and Caribbean continental plates, just north of the Puerto Rico Trench. With depths ranging from 5,000 - 6,000 metersb, our data collection efforts in this deep water will test the depth limits of our multibeam sonar, and will build on existing modern sonar mapping data coverage collected and compiled by the USGS. All multibeam data will be fully processed according to standard onboard procedures and will be archived with the National Geophysical Data Center. Ancillary sonar datasets will be archived at the National Oceanographic Data Center. A live 24-hour Internet video feed will be broadcast throughout the cruise displaying our realtime data collection efforts. More information on how to get involved in the cruise can be found here. As part of our survey of opportunity program, we will deploy deep-diving free vehicles at various locations in our working grounds (Fig. 1, orange pentagons). The vehicles, designed by Dr. Wilford Schmidt and his team at the University of Puerto Rico, Mayaguez (UPRM), are unique in their capability to collect information in the hadal zone. The hadal zone includes the deepest parts of the global marine environment, including everything in the ocean deeper than 6,000 meters (see Fig. 1, 6,000-meter yellow contour line). The UPRM free vehicles are rated to 9,000 meters and have swappable payloads including CTD and ADCP profilers. CTDs provide seawater Conductivity, Temperature, and Depth, and ADCPs, or Acoustic-Doppler Current Profilers, collect current, temperature, and backscatter intensity. Collecting these oceanographic datasets in the understudied hadal zone of the Puerto Rico Trench will provide some of the first information on the interface between the North Atlantic Deep Water and Antarctic Bottom Water masses. As the free vehicles descend to and return from the bottom of the Trench, we will be in water depths too deep for our 30 kHz multibeam sonar to map the seafloor. To make best use of ship time, in partnership with scientists from the USGS, we will run opportunistic subbottom data collection lines (see Fig.1, white lines) over sections of the Trench where new data will aid in understanding the geologic context of the region and related geohazard prediction modeling. With the exception of transiting over trenches, we have never actively surveyed with our subbottom in water this deep. We will use telepresence to collaborate with shore-based scientists to experiment with subbottom sonar settings in order to attain the highest possible data quality. As part of the NOAA Office of Ocean Exploration and Research's mission to train the next generation of ocean explorers, we will host three Explorers-in-Training during this cruise. Through this program, we bring undergraduate, graduate, and recent graduates on mapping cruises to learn how to collect and process seafloor mapping data and to gain exposure to working offshore. The students are paired with a senior watch lead and gain firsthand experience in sonar data collection and processing. The trainees for this cruise hail from the University of Puerto Rico (graduate student), the University of New Hampshire (undergraduate student), and the University of South Carolina (recent graduate, Knauss Fellow). In partnership with the NOAA Teacher At Sea program, we will be host Theresa Paulsen, a high school science teacher from Washburn, Wisconsin. Throughout the cruise, Theresa will provide updates on her experience at sea here . bSmith, W. H. F., and D. T. Sandwell, Global seafloor topography from satellite altimetry and ship depth soundings, Science, v. 277, p. 1957-1962, 26 Sept., 1997.